I liked a Rizzoli & Isles crime story! What's up with that? I don't know why. I can't explain it. Last night as I was watching the latest episode of Rizzoli & Isles I discovered, much to my horror, that I actually LIKED the CRIME STORYLINE. Ladies and gentlemen that does not happen with this show! Unless it has to do with Maura's mobster father I don't care about the murder nor who did it. What is going on here?? I look back at it now and it was not anything overly exciting. Drag racing. I don't get into drag racing. Car blows up. Okay, yeah and? I have been trying to put my finger on why it is that suddenly the writers have managed to keep my attention focused on the crime. If you look at my Rizzoli & Isles rants and reviews in the past I have always been upfront about the fact that the crimes in this show are secondary with me and I really could care less. It wasn't even some wonderful subtext between Jane and Maura. Nice friendship scenes and funny moments but nothing that screams rizzles. So, here I sit - baffled. Was it just decent writing? Incorporating everything well enough to hold my interest to all of it? I really can't say. This season has been very up and down for me. A gradual build to one of the best episodes of the series (4x05) back down to the, 'yeah just another episode' episodes, and then this. Don't get me wrong, I'm not complaining. I'm just wondering out loud how or why this happened. Why now? Why this episode? I'd love to hear your thoughts? Write to me here or on Twitter. This is a sad day for fans of the show Rizzoli & Isles and for family and friends of Lee Thomas Young. My heart goes out to his family, friends and co-workers. "It is with great sadness that I announce that Lee Thompson Young tragically took his own life this morning," manager Jonathan Baruch said in a statement. "Lee was more than just a brilliant young actor, he was a wonderful and gentle soul who will truly be missed. We ask that you please respect the privacy of his family and friends at this very difficult time." A spokesperson for the Los Angeles Police Department said Young was found dead of a gunshot wound in his Los Angeles home on Monday. The L.A.P.D. confirmed to NBC News that when Young didn't show up for work on the TNT crime drama "Rizzoli & Isles," police were sent to Young's home where his body was discovered shortly after 8 a.m. PT. "We are all without the words to truly express our collective grief and profound sadness at the loss of such a sweet, bright light," "Rizzoli & Isles" showrunner Janet Tamaro tweeted on Monday. "We are broken-hearted." Actress Gabrielle Union also mourned Young on Twitter, tweeting, "I had the pleasure of working w/ #LeeThompsonYoung on Flash Forward & he was an extremely talented beautiful soul. My thoughts & prayers are with his loved ones." Young starred on "Jett Jackson" from its 1998 pilot through the show's cancellation in 2001, and also played the role in a follow-up movie. The character of Jackson was a young actor who moved from Hollywood to a fictional small town in North Carolina to live with his father while continuing to film the television show upon which he played a teen spy. Young was nominated for two Young Artist lead actor awards for the role. Young portrayed running back Chris Comer in the 2004 movie "Friday Night Lights." His other movie work included parts in "Akeelah and the Bee" and "The Hills Have Eyes 2." He also appeared on television shows, including "Smallville" and "FlashForward," as well as the regular role on "Rizzoli & Isles." Young, a South Carolina native, was inspired to become an actor when he played Dr. Martin Luther King Jr. in a play when he was just 10 years old, a biography provided by TNT stated. On "Rizzoli & Isles," he played Detective Barry Frost, the computer-savvy but squeamish partner of title detective Jane Rizzoli, played by Angie Harmon. "Rizzoli & Isles" had planned to shoot the final episode of its fourth season this week, but after news of Young's death broke, production on the crime drama was shut down Monday. Rizzoli and Isles: Just when I think I'm out it pulls me back in. Or does it? Rizzoli and Isles has had a fairly good four year run ratings wise so it's no surprise that it's been picked up for a fifth season. (TNT Renewals) That's great news. I'm happy for them. But as the show seems to get more and more popular I find myself going from a fervent fan to an average viewer. Season one had already aired when a friend told me I had to watch this show. Thankfully she had a DVR and I could catch up. I fell in love with it. The characters then the actors captured my attention. I started using my Twitter account, which had sat dormant for over a year, just to find Rizzoli and Isles fans and follow it's stars. Next thing I know I'm building a website, making music videos, flying to benefits simply to meet one of the stars... Then something happened. During the third season I found my interest waning. There is one storyline I have loved from the beginning, or more specifically from season one episode nine. Dr. Maura Isles' family. 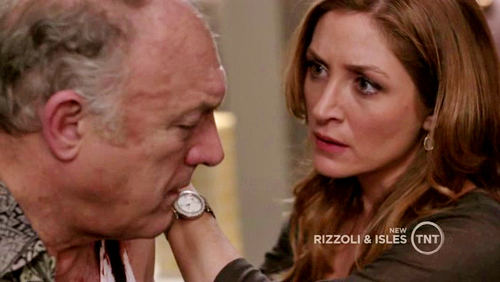 Adopted, Maura finds out in season one her biological father is a mobster. John Doman is an amazing actor and the two of them on screen are dynamic. 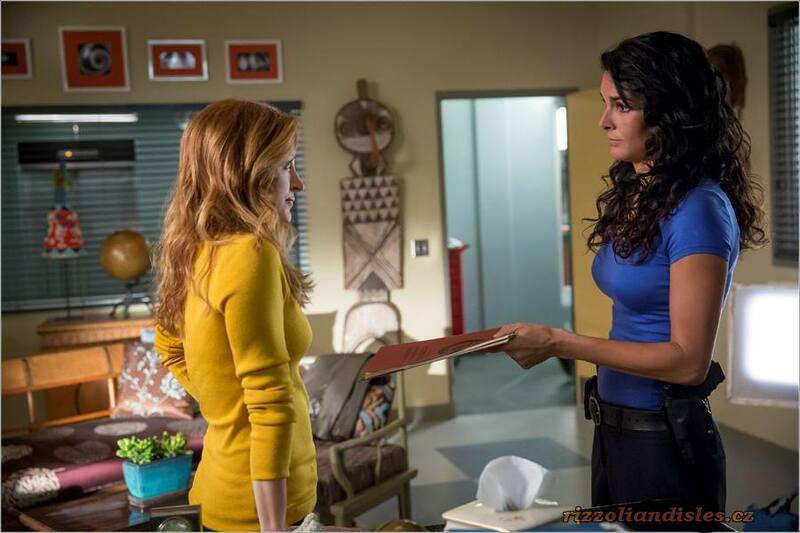 In season three Maura finds out her biological mother thought she was dead and that she has a half sister. Again casting did a phenomenal job. I love Sharon Lawrence as Maura's biological mom. Maura's family storyline continues now in season four. I still love it. 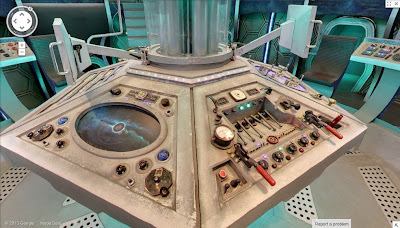 But somewhere in season three the excitement for the show as a whole dwindled. By season four I was happy to watch it just like watching any of the other dozen shows I watch. No more, no less. It was great to see Sasha Alexander (Dr. Maura Isles) every week and follow her storyline, but that had become my main motivation for watching. Surprisingly, the first five episodes of season four began to capture me again. It was like watching for the first time again and I was thoroughly enjoying it. Episode five was arguably the best episode so far. (Maura's family, including her mobster dad was the storyline so I may be a bit bias.) I was quoting The Godfather on Twitter - just when we thought we were out they pull us back in. I was feeling good about this turn of events. And then the next few episodes aired and I find myself back where I was before. Just another episode. Just another one of the dozen shows I watch. I love the actors and characters - the chemistry between Sasha and Angie has always been electric - and I like most of the family storylines. Some of the crime stories are okay but the crimes have never been my reason for watching this show. I'm still going to watch it. If I could sit through every episode of the fifth season of Xena: Warrior Princess I can certainly watch some average episodes of Rizzoli and Isles. I still like the show. That's what saddens me, however. I used to love the show. But you never know. Maybe, like Xena did after their fifth season, Rizzoli and Isles will be able to pull me back in to stay. 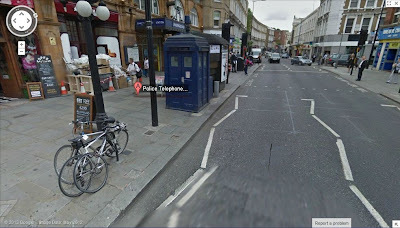 Google Maps Easter Egg - The TARDIS! Take a tour of the TARDIS while it lasts! Click here to go to the google maps page. Move your mouse until you see the arrows. 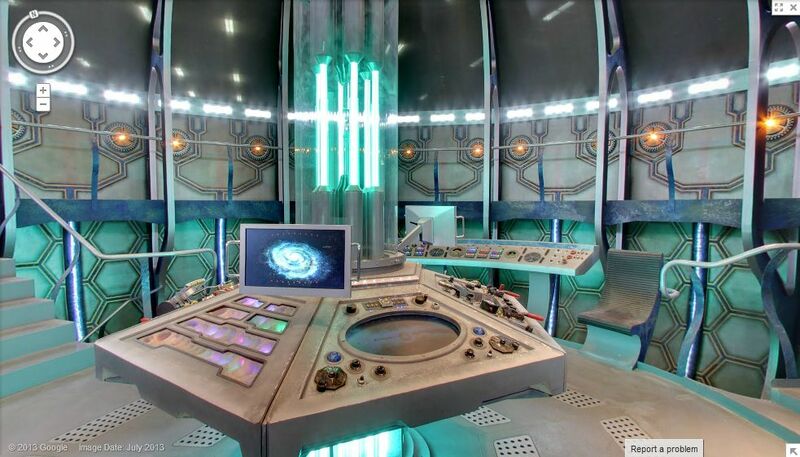 Click on the double arrow and it takes you inside the Tardis. I haven't used MySpace for quite a few years but I used to have several accounts. Apparently MySpace decided not only to completely redo their site but they also removed everyone's personal data. It was very strange going to my pages and seeing nothing familiar except my avatars. I thought that I was missing something. Surely all the pictures and blog entries are there somewhere. I checked my emails. Did I get an email warning me to save my data because they were deleting it? No. Now, because I didn't go to MySpace anymore I wasn't very upset, but it did get me thinking - This is going to be Facebook in 10 years. Think about it. What's to stop them from deciding to start over and deleting all our pictures and posts. MySpace has been dead for years, and we all know that, but that doesn't mean there weren't people there that had pictures and blog entries saved from their years of using it. Some people I'm sure felt secure that they could go back and see the page dedicated to a love one who had past on, or old stories they had written as a teen. Thank you everyone for your feedback regarding your classic Myspace blogs. We understand that this information is very important to you and apologize for not providing an answer sooner. Please understand that your blogs have not been deleted. Your content is safe and we have been discussing the best ways possible to provide you your blogs. I'm glad people will hopefully be getting there things back. But still, too little too late in my book. Did they not see that people would be in an uproar? If they had they would have changed how they did this. It's not that MySpace has decided to remove the old to make room for the new. It's that they never considered the fact that they were dealing with people. Real people with honest emotional attachments. Let this be a warning to all of us who are now on Facebook, Twitter, Tumblr and other social media sites. Even cloud drives. Eventually those will get taken down, transformed, and all that data you've been saving for years will be lost. Back up your stuff. Don't rely on the internet to keep it safe.